Silent will be the next one to kill the heart. I want to hear about it when you do that. I’ve been trying Silent, got to the heart three times in the last week and died every time. Three different types, too - one all-out poison, one poison+block, one shivs. Short of just stumbling into exactly the right cards and relics to make an uber-deck, I dunno what else to do. I’m a bit tired at the game and its randomness after 16 hours. After having some problems, I looked at a video guide and… yeah, I think the game maybe isn’t 100% for me at this point, as I’m playing more casually. I think the issue with the game is that at low levels, it feels too random and out of player control. Now, if you have enough experience with the game, after playing 50 hours I guess, the randomness is mitigated because you know all the relic and cards and possible synergies, so the moment you see any given relic or card, you know that that card could be a viable choice if in the future you get A other cards and B relic, and in the other hand then you should avoid fights of C type. That’s where the real strategy reside. But until you reach that point, the game sometimes feel like pulling the lever of a slot machine, hoping for the correct combination to appear by the RNGJesus. Isn’t that pretty much boon and bane of all rogue-likes? Yeah, if you dislike “play the hand you’re given as best you can” with no guarantee that all hands are created equally as a game concept, this is definitely not for you. It’s very much different. RL have randomness but at much more lower quantity, just some level can have slightly more or less enemies, or a weapon with a passive bonus of such or such type, or have a tougher enemy sooner in a run than another. Here both your possible basic actions that you can do are random each turn and what cards and relic you find are, and the game is very combo heavy, so there cards X and items Y that by separate are nothing great, but if you match both (/pull lever) suddenly you have a murder machine in your hands. There are times where you don’t get the needed synergy and have a much more hard times, and others you get Corruption and Dead Branch and Feel no Pain and suddenly the game is easy mode. Don’t misunderstand me, I got my fun during these 16 hours, it’s just that I think this is it, I’m going to stop here. Doesn’t work that great for now. Had couple of runs. Went full poison (relic that gives an additional poison each time you poison someone) and died from some random misfortune. The last run was interesting. I got a relic that gives you +1 strength for each 3 attacks early, and another one gives 3 shivs. Never got that talent that gives you a shiv each turn, this one would help. Had a lot of poison and tempo too, but never got a mana relic so I was starving for mana all the time. Naturally, Act 3 boss is freaking timelord and you can guess what happens when you try to murder it with your shivs. After mastering The Defect going back to Silent feels like a downgrade. Maybe modern short rogue-like-lights. In a classic one like NetHack or ADOM you eventually figure out what do you have to have on lower levels. Of course you can still die from a random stray arrow, but it’s a more guided approach - more like FTL where there’s a specific end boss and you really have to know what he does. In StS the heart has some quirks but to me it doesn’t feel like you have to pursue a specific strategy against it. Another thing is that few classic Roguelike are as brief as StS or FTL or Binding of Isaac. They leave some ways for you to grind. Those roguelights understand the pain of losing 42 level Palading after 20 hours of play in Angband so they make sure that you never “lose” more than an hour or two of progress. Even some longer games like Invisible Inc seem to suffer from being too long and ending because of one wrong move. Once all the powers and exhaust cards are gone, that’s a massive block engine with Calipers to maintain it turn over turn. 20 turns to win, which I think means that that was the run where I survived 800 or 900 damage in one turn, once the Heart starts adding 50 strength at a time. So…Ascension levels. I’ve not been checking that box…maybe I should? I thought it was making the game harder so I should try to win once (per char) without it first, but you get more rewards too. Better off with Ascension, maybe? I don’t think this is true - Ascension is just harder and harder the further you get. It’s more a bragging rights thing (and you get higher scores as well, fwiw). I didn’t set out to duplicate what @Kyrios did, but that’s how it ended up. A whole ton of block, largely through 2xBlur and Burst so it kept carrying over at end of turn. Poison from one poison stab and a Noxious Fumes. Then I got lucky with The Specimen (poison carries over when an enemy dies), the Snecko Skull (each poison application +1), the Mummified Hand (play a power, random card costs zero, really helps getting set up), and Paper Crane (weak is -40% instead of -25%). I was on Ascension 1, and I think that actually helped since I had more chances to fight elites and get relics. Sometimes those extra elites kill you early, but if you make it past the first floor, your deck can probably beat them. So having the extra elite fights was good. Did you get rid of your basic cards in some way? I see you only have 2 defend and 1 strike cards, and one Defend is not upgraded so you probably didn’t get that event for upgrading all basic cards. I’m also not sure about usability of some cards and wondering whether I miss something or you didn’t have anything better to take. Like Die Die Die. I took the “replace starting relic with a random Boss relic” at the beginning, and got the Astrolabe, which transforms three cards and upgrades them. That got rid of 3 defend/strikes, and it looks like I removed two more (I actually have three strikes, there). I’m actually a little surprised there were that many left; even without the Astrolabe, I usually get below that on a winning run. I think I got Die Die Die fairly early; it’s quite strong in the first and second areas, and since it exhausts, I don’t usually mind taking it if there’s nothing better and it’s early enough. Distraction is the other card that really doesn’t make sense here, and I think it was just an Astrolabe remnant that I didn’t get rid of along the way. Picked up a Dead Branch with the Silent. “What good is this?” says I. Then I stare at Shiv. Oh. Anyway, that run ended in ruin, but I finally slaughtered the heart with a deck filled with draw and block. I even took a relic that gave me one energy at the cost of not seeing enemy intentions. Didn’t matter. Blocked to victory, with a bit of Deadly Poison. I swear to god, this game knows when I’m doing well with Silent and throws that time slug my way. I got relic that gives +3 damage to zero cost attack cards. I got 2 talents that give you a shiv each turn, 2 talents that give +3 attack to shiv and in the end my shivs strike for 15 damage. Plus I have several defense cards that grant shiv. I own the battlefield, I obliterate. Bu then this slug comes along and by the time it gets to its healing phase it has 8 strengths even though I try to be very conservative with my shivs. 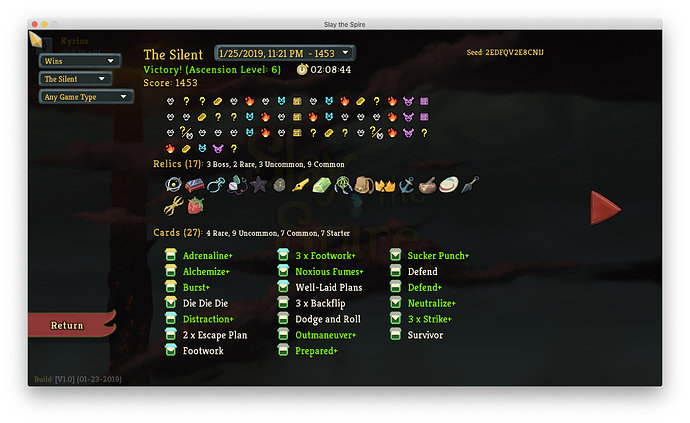 And somehow I’ve realized that the last couple of runs weren’t fun. I’ve only killed the heart with The Defect. Doing it with the Silent seems less interesting. With Defect I had several ideas for the killer deck. Maybe I’ll have a lot of talents, and those talents make other cards cost 0, and improve tempo, and I go through those talents quickly. Maybe I’ll have a quick charge of my spheres, lightning and ice ones so that I get a lot of armor and attack out of nowhere. Maybe I’ll have a lot of focus and use those dark spheres to great effect. Maybe all of that, maybe only one - it all can work in theory. With Silent I can only see a single perfect deck - the one with a lot of armor and poison. The only optional thing is using shivs or not using them. She needs poison, she need those low cost tempo cards. 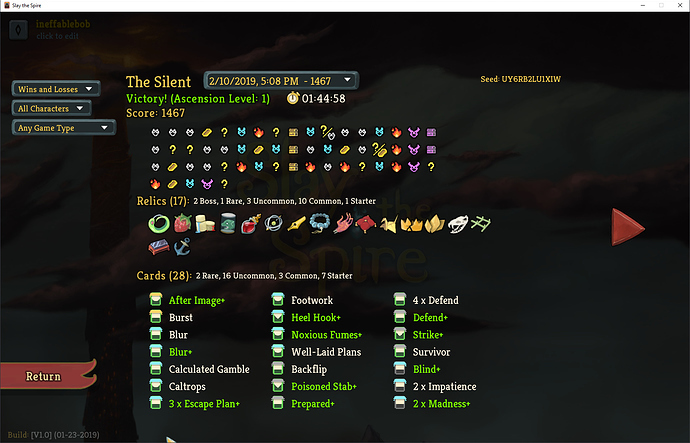 So when I play as Silent I’m not thinking about what to do with the hand I was dealt (as in what relics and cards I get) but how far am I from a single perfect deck. Plus, that timey-whimey slug seems to exist to specifically counter Silent. This is still one of the best games ever mechanically and I’ve spend wonderful 60 hours in it. None of those infinite time killer games have ever captured me for so long (with exception of Desktop Dungeons, but this one also has a storyline and much more unique non-repetetive content). But enough is enough. I agree she’s got less obvious archetypes. There are at least a couple of options for how you do Poison/Block - deck cycling, direct poison, stalling with fumes, etc. There is also a shiv/strength deck lurking in there, instead of poison, but it relies on a relic or two. I’m in the same boat, haven’t played for a few days. It’s a great game to learn, and when things come together it’s a lot of fun. But once you know how things work, the majority of runs devolve into hoping the right stuff drops for the deck type you’ve decided to try for. Which isn’t that different from most deckbuilders but it’s so much more complex with the relics and limited card choices and hitting the right bosses. For me, it just gets tedious and frustrating. When they add some more new stuff to discover, I may come back. I’m early on in the game, and still at the stage that I’m loving this game. My only complaint is that seems like some bosses are uneven. Like the boss that has 2 sentries that steal your best cards… it’s cool, but why’d it also have to have a super beam that hits for 40 or sometimes even 70 damage? I don’t understand how you’re supposed to block that kind of damage.